SparkFun started selling a AD8232 Heart Rate Monitor (EKG or ECG) recently so I grabbed one. 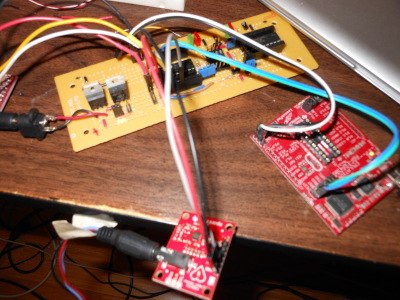 Was really easy to hook up to an MSP430G2553. So simple I didn't bother to waste time drawing a schematic. 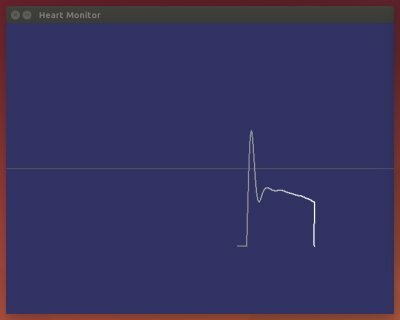 The MSP430G2553 simply has RX/TX hooked up to a UART to RS232 converter and the output of the heart rate monitor goes to pin P1.4. I didn't bother using LO- and LO+. I believe those are there just to detect if the thing is hooked up correctly. I was in a hurry and didn't care much if it displayed noise when it the electrodes were floating. On the computer side I have a very simple app written in Objective-C using SDL to draw graphics. Why Objective-C? Because I want more practice with it in case some iOS jobs open up somewhere that look interesting :). Actually, I did have the thought of hooking it up to bluetooth BLE and making an iPhone app for this, but for now this is good enough. Here's a screenshot of the SDL app. Here's the circuit board. I'm using the board I built for testing Java Grinder just because I didn't feel like soldering new.